CNG: eAuction 438. GERMANIA SUPERIOR. Æ Dupondius (27mm, 12.42 g, 6h). Countermark applied during the reign of Nero, AD 54-68 or the Flavians, AD 69-96. 438, Lot: 331. Estimate $100. GERMANIA SUPERIOR. Æ Dupondius (27mm, 12.42 g, 6h). Countermark applied during the reign of Nero, AD 54-68 or the Flavians, AD 69-96. 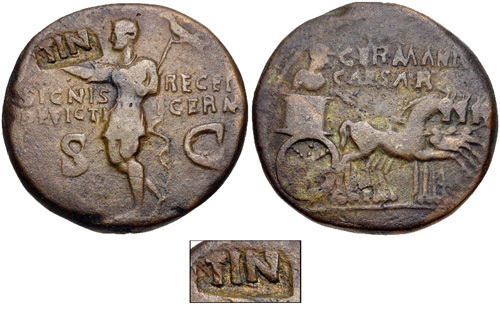 TI (ΛV) in rectangular countermark on a bronze dupondius of Germanicus. Pangerl 54. Host Fine, c/m VF, brown patina.